﻿ Best Price on Hotel Linda Vista in El Fosforo + Reviews! 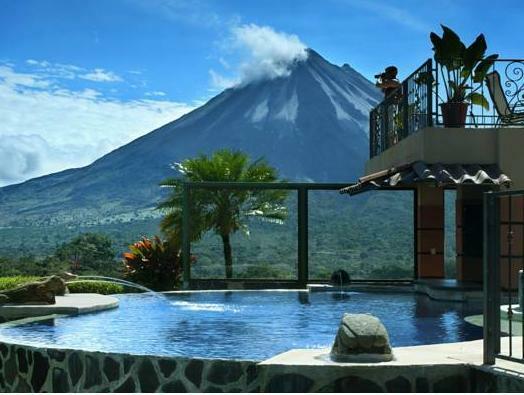 Offering stunning views of the Arenal Volcano and surrounding rainforest, the Hotel Linda Vista features an outdoor pool, a hot tub and lush gardens. Lake Arenal is less than half a mile away. Each room and suite at the Linda Vista offers wonderful views of the volcano, lake or rainforest. All rooms have free Wi-Fi, a ceiling fan, a safe and a bathroom with free toiletries. Hotel Linda Vista has a bar and a restaurant serving fusion cuisine. A free daily breakfast is included. You can go on rainforest canopy tours at the Sky Adventures Theme Park, located just over 1 mile away. Hotel Linda Vista can also help you to arrange trips to the Arenal Volcano, just 3.5 miles away. The town of La Fortuna is 14 miles away, and El Tanque Domestic Airport is a 30-minute drive away. Juan Santamaria International Airport are 3.5 hours away by car. Very nice hotel providing all the necessary amenities and services in a semi-wild location with great views and superb flora and fauna right outside your door. Very accessible in a 4 wheel drive vehicle which are easy to rent in Costa Rica. While the hotel looks remote on a map, it is within short driving distances to major eco-tourism locations and within walking distance to a nearby village. Also, it is not in La Fortuna with its over the top hotel complexes. Good value for the money. Super Lage mit Blick auf den Vulkan und den See. Das Hotel hat zwar seine besten Tage schon gesehen, aber es ist sauber, die Leute total nett und zuvorkommend und das Essen überaus lecker. Gerne wieder.